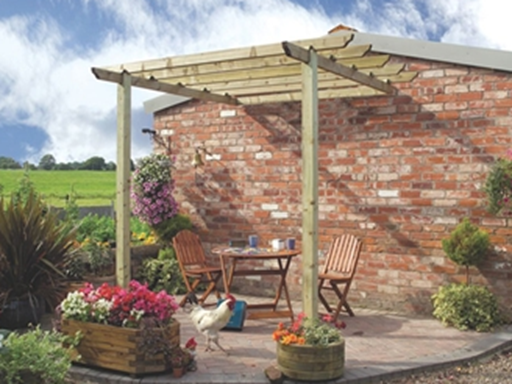 Got your eye on a pretty pergola but are worried that your garden could be too small? With eDecks’ top tips for pergolas for small gardens you don’t have to give up on owning the garden of your dreams. 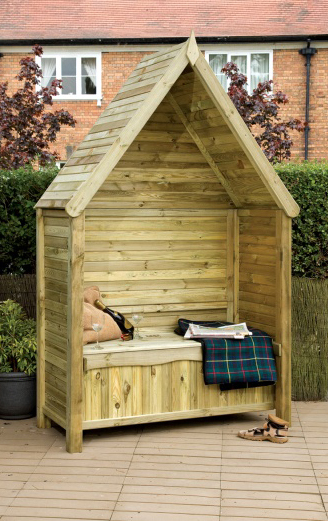 Simply follow our guide and you can make the maximum impact using minimum space. Quickly turn your pretty patio doors into a garden feature by attaching your pergola onto your home. 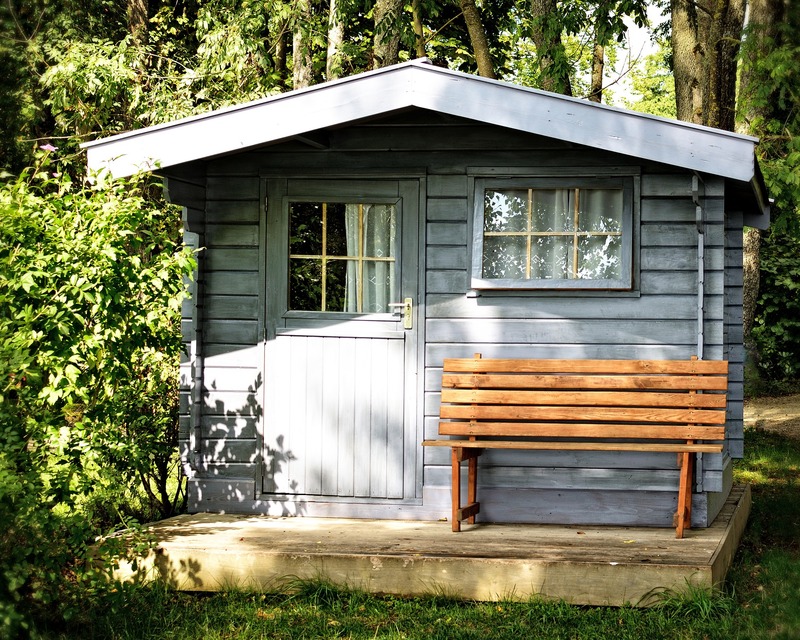 When you’re selecting a pergola make sure to consider the overall aesthetics of your home; a natural wooden pergola is ideal for giving your garden a country cottage feel whereas, a metal pergola will instantly give your home a modern edge. We recommend eDecks’ stylish Dragon Patio Pergola. Make your pergola work harder by using it as a sturdy frame for climbing plants. Use varieties of plants such as ivy, Californian lilac, climbing hydrangea or climbing roses to add a splash of colour to your garden in time for spring. One advantage of swapping a walled garden for a pergola is that the slats allow more light to reach the plants so you can enjoy bigger, brighter blooms that flower for longer. eDecks’ Portico Pergola is ideal for narrow gardens and, it’s manufactured from high quality timber so you don’t have to worry about your plants climbing frame succumbing to the elements. Think you only have space for a patio or a pergola? Think again! 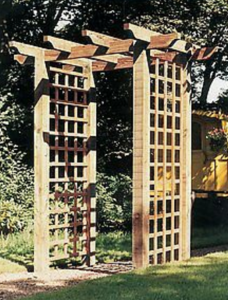 Pergolas are the perfect finishing touch for wooden, brick or concrete patios. The trick to creating a pulled together look is to install a pergola that compliments your patio to ensure that it blends in seamlessly. eDecks’ Traditional Patio Pergola is finished with a natural green tint to give you a blank canvas which you can easily customise with a stain or varnish of your choosing. Don’t let a small issue like space come between you and your perfect pergola! 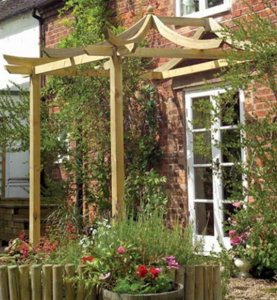 Browse eDecks’ range of pergolas for small gardens online today. This entry was posted in Gardening Advice on February 18, 2015 by peach. If you’re like us and are looking forward to nothing more than relaxing in your beautiful garden, having a decking area is an excellent option to provide space to entertain guests, let the kids run about, dine outside or simply lounge in the hopefully beautiful British weather. Due to decking becoming so popular, there are a number of decking material options available, but which one is right for you? 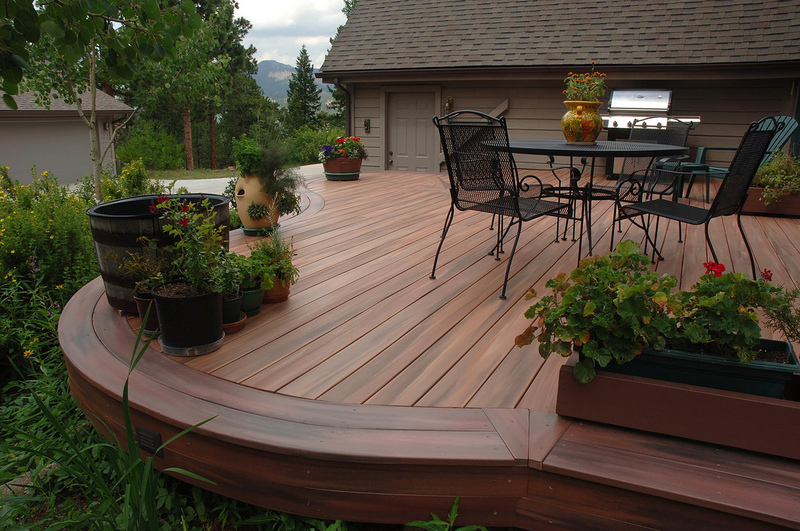 Two of the most popular options are hard wood decking and composite decking. Each have their own unique characteristics and benefits. Below is a quick outline of the numerous benefits to help you decide which type of decking suits you and your family best. Hardwood decking helps create a beautiful addition to your home and garden. Choosing wood decking allows your garden to benefit from a rustic elegance that can only be achieved with wood decking boards. Hardwood decking boards are also amongst the least expensive material used for modern home decking. 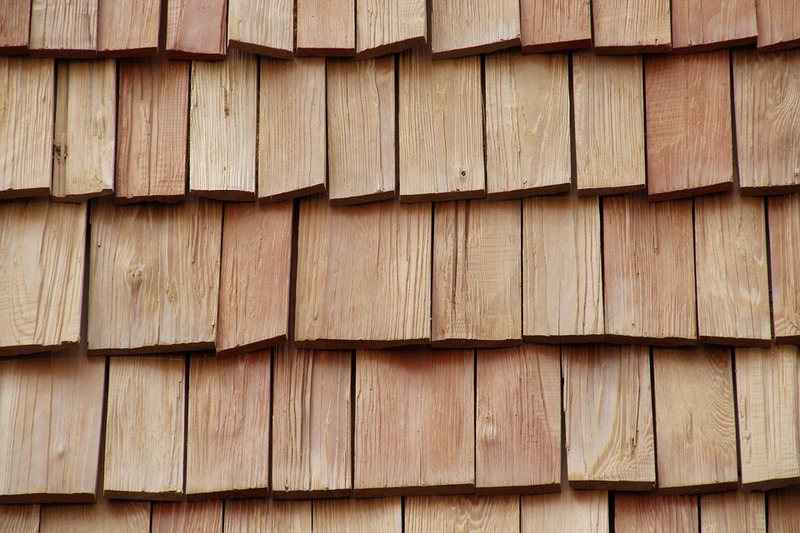 So if you are looking to stick to a budget, you will be well suited with hardwood boards. It’s also ideal for supporting various furniture, barbecues and extensions because it is so strong and durable. If you need to install decking lights, this can be easily achieved with wooden decking boards compared against other materials. Due to hardwood decking offering a greater degree of flexibility, uneven surfaces or slopes in your garden can be overcome by building a hardwood decking frame as they can be adapted to deal with any decline or incline. 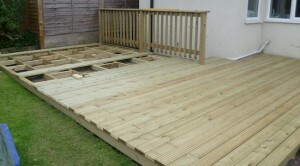 Wooden decking boards do require maintenance over their lifespan. To help them keep that natural shine, it will be necessary to polish the surfaces one a year to protect the colour and keep the wood looking natural. The first sign of deterioration on your hardwood decking are typically cracking, splintering and colour fading on the boards. The odd nail will need to be replaced one in a while and a regular sanding will also do wonders to protect the fine look of your decking area and protect against splitting and rotting. Most modern hardwoods have natural resistance to effects caused by insects, saving you the cost and effort of having the boards pressure treated compared to soft timber boards. 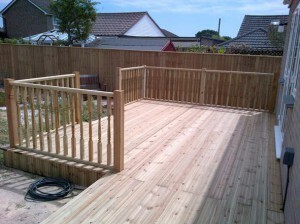 Composite decking is rapidly becoming the most popular option for garden decking. This is because it is a highly durable material that offers multiple long term benefits. Due to being a combination of natural wood and recycled plastics, composite decking boards don’t need to be sealed like true wooden decking and will also resist decay and rotting far longer as it will be fungal treated during the manufacturing process. This means there is little chance of insect damage boards giving way and spoiling you and your family’s enjoyment of the sensational, summer evenings. Composite decking is also extremely weather resistant, handy for the several other months in the British calendar when the weather is less than dry. Although, mold and mildew can still grow on composite decking surfaces, particularly if they are in typical damp or shaded areas of your garden. You won’t need to paint, stain or seal your composite decking boards throughout their lifetime, which can be an arduous task with traditional wooden decking. 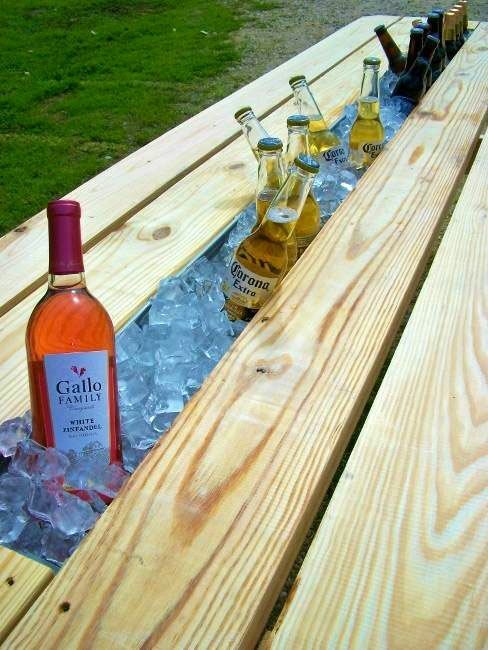 This saves you the cost and hassle of replacing rotting, split or insect damaged boards. 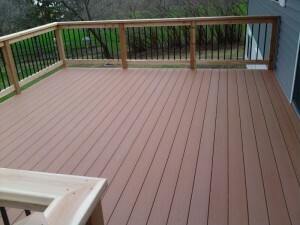 Composite decks are perfect for young families looking to enjoy their outdoor space to the fullest. The boards will be splinter-free due to their manufacturing design, which is a big plus against traditional wooden decking. No one likes to walk barefoot on their beautiful decking area and end up in pain due to a stray splinter, particularly if there are young children or pets around. Speaking of walking barefoot on your decking, composite boards are anti-slip and heat resistant. Whether the weather is rain or shine, you can be sure you aren’t going to have any accidents walking barefoot across your new decking. Composite decking evolved from the drawbacks of traditional wooden decking such as the regular upkeep to protect wooden boards. With this in mind, composite decking doesn’t crack, splinter, lose colour or rot like wooden decking might. The boards don’t need to be sanded down, stained or treated with anti-fungal agents to prolong their lifespan. Mold does occur overtime on composite decking boards, however give them a simple clean using a brush and common household cleaners to remove any mold easily. Of course the choice is up to you but hopefully we at eDecks have answered some of the questions you had about the right decking option for your garden. 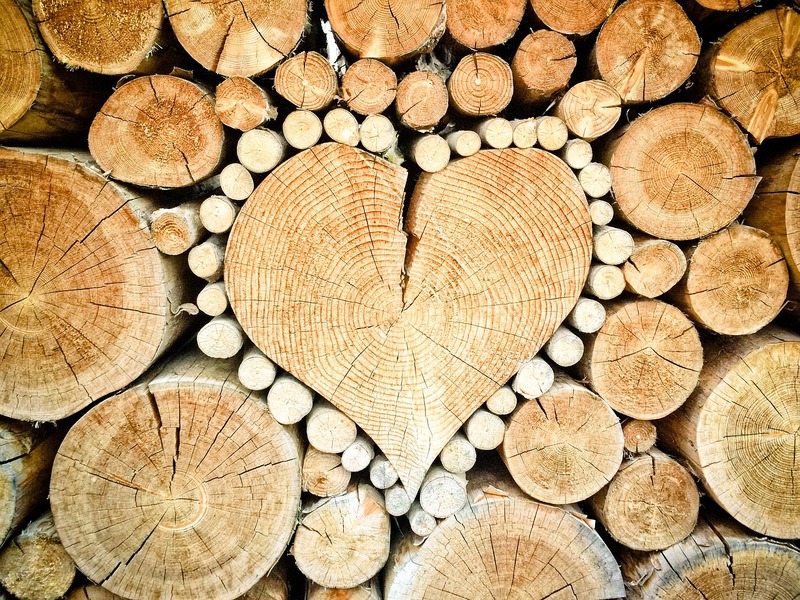 As the UK’s decking experts, we have an extensive range of Hardwood, Softwood and Composite Decking kits and individual tiles to help you compare. We would be delighted to invited you to browse through our online store or request a sample to ensure you make the right choice. 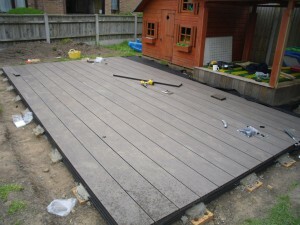 This entry was posted in Decking Advice on February 13, 2015 by peach.